Developments in roof and solar tax incentives are driving warehouse retrofits that result in large energy savings supported by substantial federal tax savings under the Energy Policy Act (EPAct) Section 179D. As part of the 2015 yearend tax extender package, EPAct tax incentives for lighting, HVAC, and roofs were extended for two years through December 31, 2016 and an enhanced solar tax incentive was extended through 2021. When roof replacements and upgrades are required, the most optimal economic results can be obtained by integrating these two tax incentives. The amount of solar photovoltaic (PV) development has increased throughout the past few years. Several states in the United States are paving the way for solar PV development, including Massachusetts, New Jersey, California, New York, North Carolina, Hawaii and Colorado. The price of solar panels has become more affordable for owners to purchase. With the combination of lower prices and tax incentives, now is the best time to include the addition of solar PVs to buildings. Large, flat roof warehouses, distribution centers, industrial, and manufacturing buildings are by far the most popular building categories for rooftop solar PV projects. Non-air conditioned warehouses and manufacturing buildings will fill the $1.80 per square foot roof tax incentive provided they have existing or concurrently installed energy efficient lighting at or below the watts per square foot level (demonstrated on the following table). To qualify for the $1.80 roof tax incentive the roof must be installed by December 31, 2016. Taxpayers who want to obtain the largest 30% solar tax credit need to commence their project before January 1, 2020. A construction completion safe harbor needs to be obtained and the project must be placed in service before January 1, 2024. The table below illustrates the gradual phase down of the solar tax credit beginning in the 2020 commencement year down to the 10% credit level for projects placed in service after December 31, 2023. With the recent huge decreases in solar PV prices, many warehouse owners are using the EPAct tax incentives to be fiscally and physically prepared for solar. Fiscally prepared refers to the reduction in current electricity and heating costs; physically prepared refers to making the necessary roof improvements to get the building solar ready. 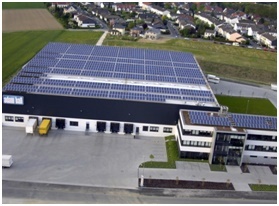 Solar PV rooftop systems are often used to generate electricity at warehouses. Warehouses typically make ideal solar installation candidates since they often have large, unobstructed flat roofs that can accommodate large solar PV systems. With a power purchase agreement, a warehouse owner is essentially renting the roof as an alternate energy electrical generator. Since the amount of solar tax credit can vary widely from no credit to 30% based on facts and circumstances, property owners should work closely with a tax advisor when starting a solar project. In January 2011, IRS released Rev. Proc. 2011-14, which enables all property owners to catch up on any missed EPAct tax deductions from January 1, 2006 and report them on their current tax return without having to file an amended tax return, a step that can be costly and inconvenient. The retroactive filing is accomplished by filing tax Form 3115 with the warehouse owner's current tax return. This change can be used proactively as a tax planning tool. Warehouse owners who missed one or more prior tax deductions can combine the missed project(s) with a new project and secure a much larger combined tax deduction. For example, presume a warehouse owner installed energy efficient lighting in a 200,000 square foot warehouse for $100,000 in 2006 but missed the EPAct tax deduction. Presume that, in 2016, this same owner has a new project involving natural gas heaters and some roof improvements for $260,000. Using Rev. Proc. 2011-14, this warehouse owner may be eligible to deduct the entire $360,000 in 2016 ($100,000 from 2006 and $260,000 from current project). Warehouse owners have unprecedented opportunities to reduce energy costs, particularly with energy efficient lighting and natural gas heaters. Large EPAct tax incentives are available to support these projects but quick action is required as EPAct is due to expire Dec. 31, 2016.